Last May, after a break of over twenty years from keeping the breed, I bought Pru the GOS sow for the princely sum of a hundred quid. 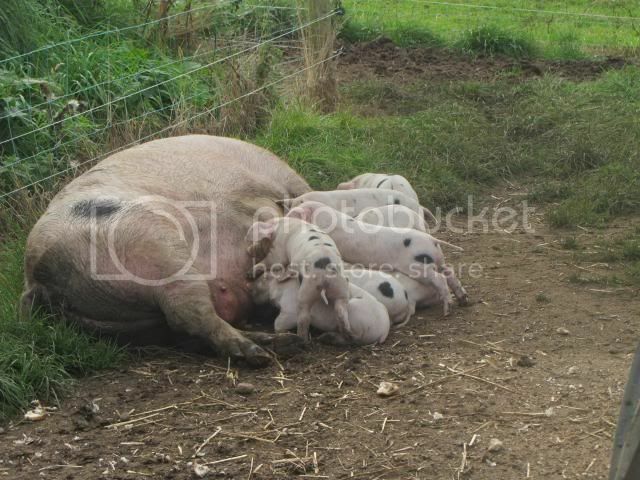 She had piglets in September. My new daughter in law Jenny captured these shots of Pru and brood one sunny afternoon. Things have changed since then, with the weather that we've all been having, their grassy run has turned rather muddy and those little piglets, are now ready for the freezer. Four of them will be off to the slaughter house tomorrow. 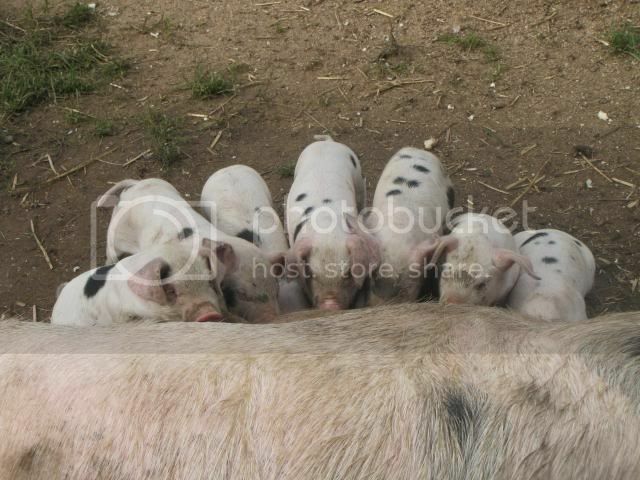 Its the part of keeping pigs that none of us like but at the end of the day, its what its all about. I'll try and get some photos tomorrow when they are loaded up, so that you can see just how much they've changed. Pru is currently running with the boar steadfastly refusing to get back in pig. Fingers crossed that she eventually plays the game. No idea about the photos John, sorry. Hopefully The Big Man (aka Danny the Boss) will be along sometime, or else someone less blonde than me might be able to help. You have managed very well. They look fantastic, although probably not too good now!! However, you are right, it is what it is all about. 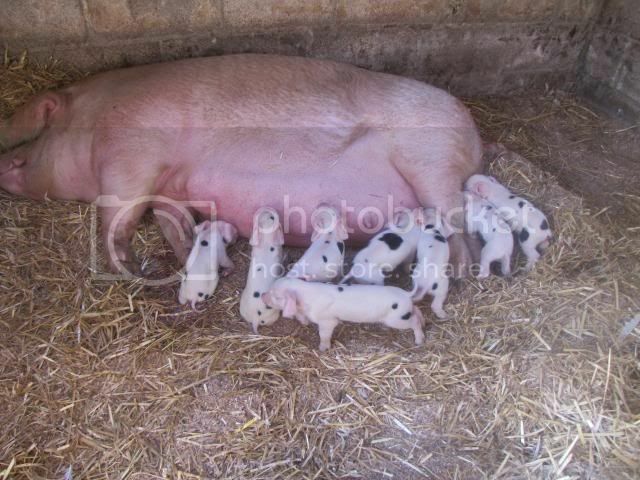 A few years ago a group of us got together and fattened up some Tamworth pigs. The meat was so good and economically it was very successful. The four finished boars were picked up a few moments ago. They didn't want to go and while its quite a sad time, they've had as good a life as I could have given them. 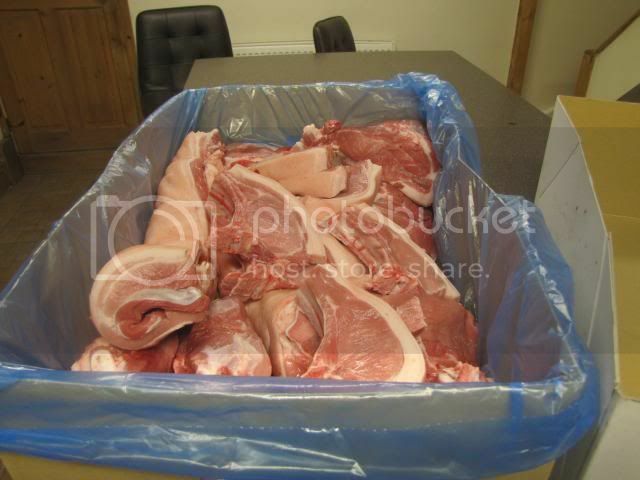 I'm glad that I've got this bit over and now we've got to look forward to picking some fantastic pork up on Saturday. That is how to look at it. I was vegetarian for over 30 years due to not liking the exploitation of animals. In the last year I have become carnivore again as here the animals spend their time in the fields and meat is always local. My lamb which comes later in the year will originate within 2 miles at the other end of my village. I have not yet coped with processing my chickens and ducks but hope I will eventually be able to as I will know how they have lived. I would love to keep two pigs for the freezer. 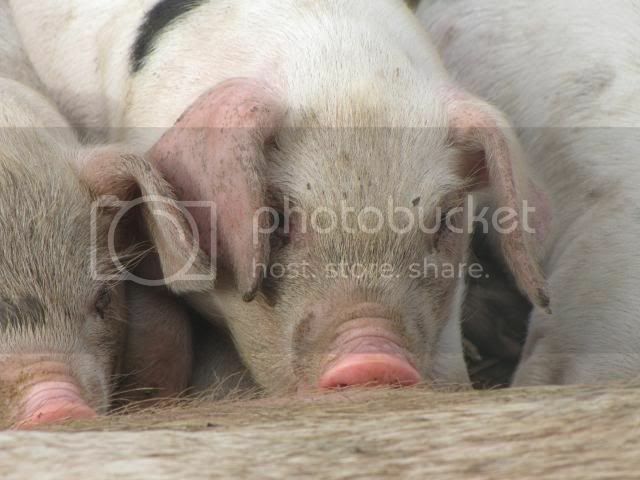 Here you are allowed to have two pigs for personal use without all the paperwork. I bet they'll taste lovely, John. 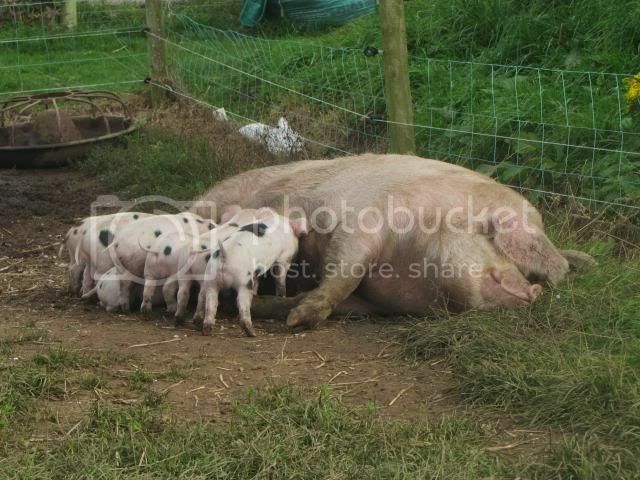 Strangely, there aren't any pigs on the many farms round here, it's all sheep and dairy cows. Oh, and they breed pheasants as well on the farm at the end of our lane, they're often in our garden eating the bird seed. 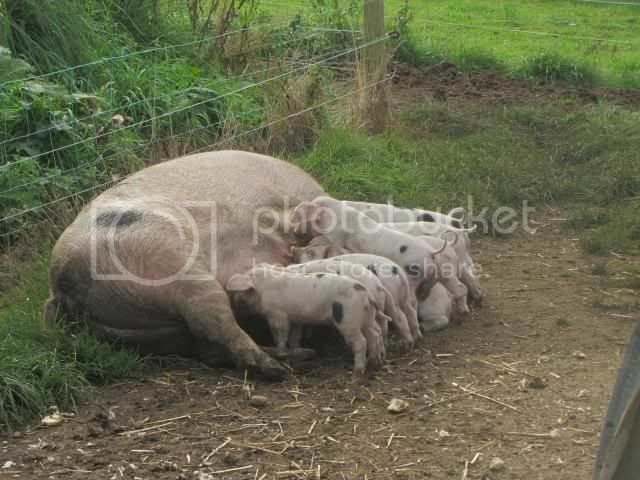 We're struggling to get Pru their mum back in pig. She's running with the GOS boar that we borrow but she didn't hold to the first mating. She repeated on Valentines day but with that little bit extra romance in the air, we're hoping for a bit of luck. We'll be keeping an eye on her three weeks from the day, hoping that she doesn't come back into season. Fingers crossed. They look wonder little piglets john and I'm sure they were lots of fun to raise. I don't have any qualms about animal slaughter when they have had a good life, and I'm sure they had that. Enjoy your pork. I would like to have a few pigs, we have talked about it, but I know it would be me doing all the looking after, as it is with the hens, and so not sure of making more work for myself. Animals are always my responsibility too but I love having them! Oh, I agree Aly! they bring such enjoyment, but it does annoy me that I end up with the responsibilities! I accept the chickens were my idea, but the dog wasn't! and she is most definitely my dog nowadays! I think I'm just too soft and cannot resist big sad eyes looking imploringly at me. 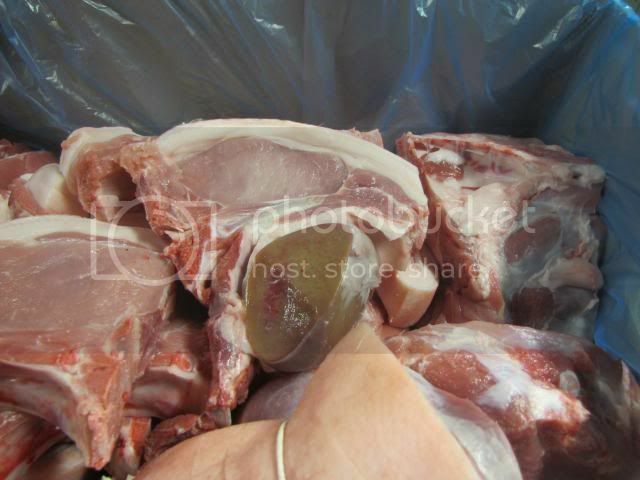 We collected the four butchered pigs yesterday afternoon and I'm very pleased with the results. It looks as though we fed them just right. The eight halves came out at between 25 and 28kg and looked very even. That will last a while! Should taste good too. We've kept a half for ourselves and sold the other seven halves.